Why to use this site? The primary motivation to use our system is simple – provide fair value and honest results to anyone wanting a computer. 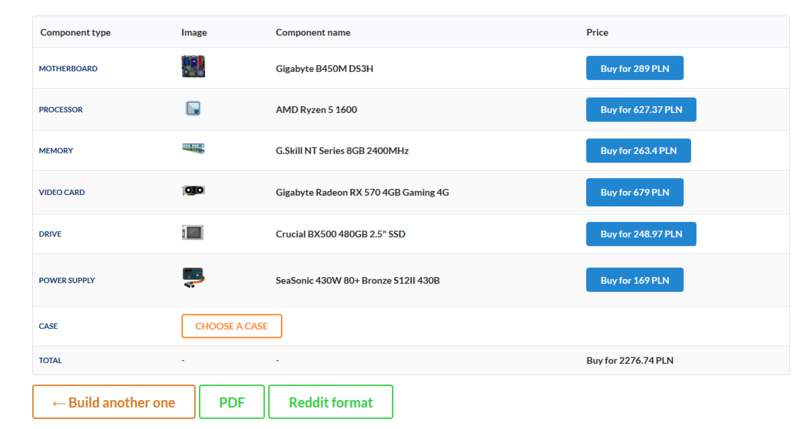 This unfortunately is not always the case and very often prebuilt computers end up being built from older, outdated components (in the world of computers single generation can yield up to 35% increase in performance at the same price bracket) or are severely overcharged. Whereas building your own rig will take about an hour from your life and just about any computer related place will happily build you one for a fraction of what you otherwise would pay. How bad can it be then? What do you sacrifice by just going to a store and picking up a desktop for your needs? Below are 3 examples of how our system fares vs real offers that I could find on the internet. For starters 3 parts on this list are unknown, we actually can’t tell what they are. This is really bad since it actually matters. In particular power supply is a scary one – it’s a part that CAN in fact blow up and destroy everything connected to it. Whereas if you choose right you end up with a stable unit that will last you years. Our system has opted for a Seasonic S12II 430W. Among other things it offers a 5 years long warranty and comes from a renowned manufacturer. Next on the list is upgradability. FX 8300 dates back to… 2012 (I wish I was joking). Performance aside it’s a dead end platform that can’t be upgraded whatsoever and you can just throw it to a garbage bin, RAM and motherboard are unusuable in current generation hardware. Our system has gone with a Ryzen 5 1600 bundled with B450 motherboard and 8GB DDR4 memory. This platform was confirmed to support processors that will be released in the middle 2019. So if you feel like upgrading your machine – feel free to! Finally, performance. Starting from ther processor Ryzen 5 1600 is massively faster than FX 8300. We are talking up to 40% performance increase in video games and up to 90% in professional software. It also requires significantly less power to run, saving you money in the long run. Video card is the last part that really matters. In fact GTX 1050Ti is the only somewhat redeeming quality in this build. It is a current generation card and it can in fact run games at medium-high settings. However this does not mean it’s anywhere close to an RX 570 – differences between these two cards can reach 50%. Or, to put it into more practical terms – if you decided to play Witcher 3 in full ultra settings there are areas at which GTX 1050Ti pulls 22 frames per second (turning it into a slideshow) whereas RX 570 will be able to hit 33 frames per second. Here’s a review that showcases both cards. Of course, it’s not always THIS bad but frankly speaking it can very well be. I have provided 2 more options in different price levels, coming from massive companies specifically selling gaming hardware. Drive Crucial BX500 480GB 240GB WD Green SSD + 1TB HDD (details unknown) We have a bigger SSD but no HDD – comparable. Power Supply FSP Group Aurum 550W 80+ Platinum 600 Watt - Standard 80 PLUS Gold – details unknown Our build offers higher efficiency but slightly less power so they are comparable. Are our builds always guaranteed to be better? No. But as you see from tables above, they generally are and at the very least provide a solid initial choice to customize upon.